In this video we will discuss implementing a checkbox list in asp.net mvc. We will be using table "tblCity" for this demo. We should be generating a checkbox for each city from the table tblCity. 2. From "Add New Item" dialog box, select "ADO.NET Entity Data Model"
3. Set Name=SampleDataModel.edmx and click "Add"
4. On "Entity Data Model" wizard, select "Generate from database" and click "Next"
6. Type "SampleDBContext" as the connection string name and click "Next"
8. Type "Models" in "Model Namespace" textbox and click "Finish"
9. 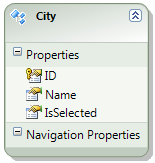 Change the entity name from "tblCity" to "City"
Right click on the "Views" folder, and a "Home" folder. Right click on the "Home" folder and "EditorTemplates" folder. Copy and paste the following code in "City.cshtml"
Please Note: Put the templates in "Shared" folder, if you want the "Templates", to be available for all the views. View Engine = Razor and click "Add"
How to get the selected data on another page . various way to send selected data to another page, 1- Using FormCollection. 2- Use data model object. How to use this helper in Create page?and how to display what i select item? how to pass collection of model class from view to controller without using editor templatpe? Getting an error like con not convert implicitly the type bool? to bool. (1) what happens when we check the checkbox? (2) how isSelected is updated ? (3) when the form is posted dowe receive all checkboxes or only the selected ones? i get out 1234 with submit button . after all the code ? hii venkat i wanna functionality like , if i submitted the from using Submit button okay , but if some one does back the page using browser then i wanna first time displayed checkboxes. Could you please let me know how to post the data back to data base from check box, I know you showed us to to display what checked boxes user check on UI, what if we want to save that data how do we do that, I would really appreciate if you could have something information for me. I am getting error in this line of code "@Html.CheckBoxFor(x=>x.IsSelected)". Getting red square line under “x.IsSelected”. 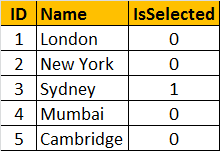 Cannot convert lambda expression to intended delegate type because some of the return types in the block are not implicitly convertible to the delegate return type"
Check your table entries, IsSelected column should not have null entries. How we handle this if the column has null entries? @Html.EditorForModel("City") with parameter. its not working. help me in this. Check the view name in EditorsTemplates. It must equals to model view. If you are getting that issue bcz when you are adding a view to index page don't select dropdownlist (SampleDbContext) your issues will be resolved.